A non-artillery Soldier carried by this unit can attack during your assault phase if this unit doesn't move during that phase. A Soldier carried by this unit can make defensive-fire attacks. Q: Can you explain how boarding and dismounting works? Q: Can units with the Transport ability carry Soldiers with the subtype Artillery, Motorcycle or Cavalry? 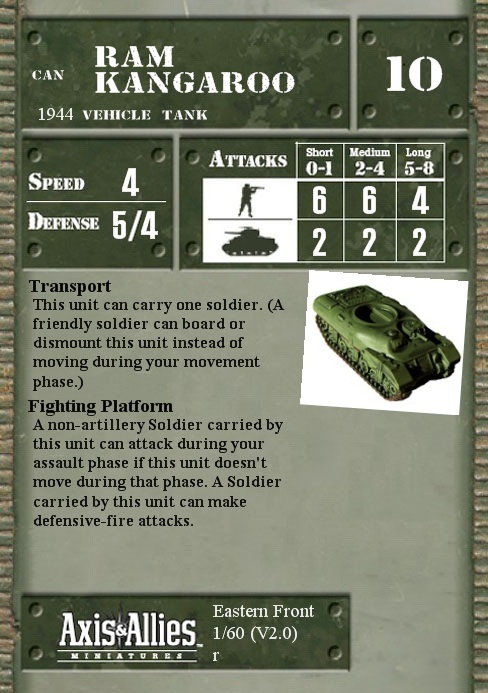 Q: Can a Soldier with speed 0 board and dismount a unit with the Transport ability? Q: While boarded on a vehicle with the Transport special ability can a soldier attack? A: No. While boarded a soldier can't attack. Only vehicles with the Fighting Platform special ability allow this. Q: Can Soldiers board and/or dismount units with the Transport ability during the assault phase? A: No. Soldiers can only board or dismount during the movement phase. Q: Can a Soldier be attacked while being transported? A: No. A Soldier carried by a unit with the Transport ability can't be attacked. However, if the Transport Vehicle is attacked and destroyed, the carried Soldier is destroyed too. Another exception would be if the Vehicle is attacked with the Blast SA. A: Yes. Blast affects every unit in the hex, including passengers aboard a Transport. The Soldier would be the target of a separate attack roll. According to the 11/12/2009 Rules Update: Any abilities that affect "each" unit in a hex, will affect boarded units. Q: If a Vehicle with the Transport SA is disrupted, are passengers disrupted as well? A: No. While a unit is boarded, it can't be attacked. But any abilities that affect "each" unit in a hex, will affect boarded units such as the Blast SA. Q: Can a Panzer Grenadier use its' ability to load onto a vehicle, move within that vehicle to a hex already containing an Oberleutnant, unload and then be included in an Angriff attack against an adjacent enemy unit in that turn's assault phase? A: Yes. A Panzer Grenadier can board a transport in the Movement phase and ride to a hex that's either adjacent to an Oberleutnant or that an Oberleutnant subsequently moves adjacent to. At the end of the Movement phase, the Panzer Grenadier dismounts for free. In the Assault phase, the Oberleutnant can use Angriff to let the Panzer Grenadier enter an enemy hex and attack. The Oberleutnant doesn't even need to be adjacent to the Panzer Grenadier at the beginning of the Assault phase. It could move adjacent in the Assault phase. As long as it's adjacent when the Panzer Grenadier takes its turn, Angriff can apply. But remember, no unit can dismount during the Assault phase under any circumstances. Q: Do Commander Abilities function while a Commander is loaded in a Transport? Is a loaded unit adjacent to anything? Does the initiative bonus still count? Q: Do dismounting soldiers provoke Defensive Fire attacks? A: No. Defensive Fire only occurs if a unit moves from one hex to another hex. Q: Does a Mosin-Nagant Rifleman need to be adjacent to a friendly commander in order to board and/or dismount a vehicle? A: Boarding and dismounting from transports happens only during the Movement phase, and the Mosin-Nagant rifleman needs an adjacent commander to move at all during the Movement phase. So it needs an adjacent commander to board a vehicle with Transport. During a later Movement Phase, the Mosin-Nagant riflemen can always dismount, even without an adjacent commander to order them off. 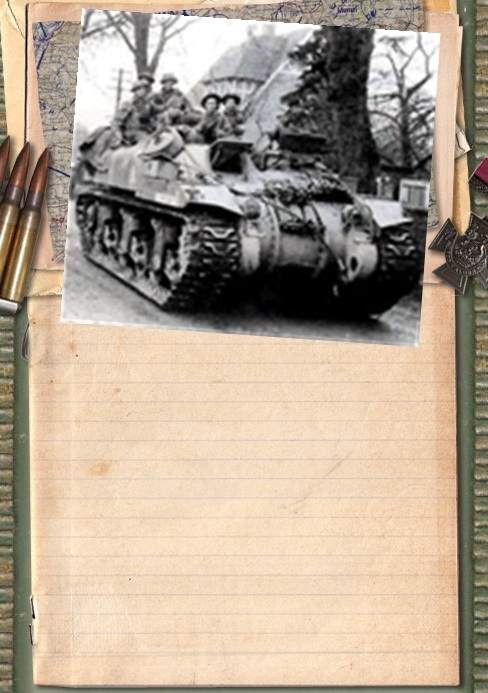 Q: Can a Soldier start a game already boarded on a unit with Transport? Q: Does a Soldier boarded on a unit with Transport count against stacking limits in a hex? Q: Can a Soldier unit mounted on a Vehicle with the Fighting Platform SA use defensive fire? Q: Can they perform a Close Assault while loaded on a Vehicle with Fighting Platform? A: Yes. Close Assault can be used without dismounting, but only if the transport has the Fighting Platform SA. Q: The French P107 Half Track's Fighting Platform SA doesn't mention the restriction for non- artillery Soldiers. Has this changed?